The latest Q3 2009 smartphone market figures from Canalys show RIM and Apple gobbling up the smartphone market as overall growth in the segment begins to slow. The global smartphone market grew just 4% over the previous year ago quarter, a major slowdown from last year's 27.9% expansion over Q3 2007. "While growth has undoubtedly slowed, it is still outperforming the overall mobile phone market by some margin, as well as driving data revenue for operators," Canalys analyst Pete Cunningham said in a statement, which also noted that sales mobile phones as a whole actually shrank by 4 to 6%. Canalys' press release only cited market share percentages for hardware vendors and software platforms, so AppleInsider did the math to chart the changes in smartphones over the last two years. The results were stunning, and contradict conventional pundit wisdom on where the industry is heading. Nearly all market forecasters have insisted that integrated hardware and software platforms like RIM's BlackBerry and Apple's iPhone can only possibly be temporary successes that will have to make way for licensed software platforms, where one company or open source group develops software and reference designs that a variety of hardware makers can purchase or use for free. For example, Gartner recently predicted in a widely publicized report that three years from now it expected to see Symbian slipping only a few percentage points to maintain its lead as the most widely used smartphone operating system. This prediction comes despite the fact that Nokia, by far the largest user of Symbian, has already started seeing its share of smartphones drop rapidly, and that the company is earnestly working to invest in alternatives to Symbian, including its Maemo Linux platform. On the the other end of the scale, Gartner predicted massive 400% growth for Android and 70-80% market share growth for Windows Mobile, while assuming that the iPhone wouldn't grow its market share at all and that RIM would lose half of its share by 2012. Most other pundits have predicted a similar shift from integrated platforms (Apple's Mac model) to licensed platforms (the Microsoft Windows model), nearly always citing the shift from the fledgling computer market dominated by Apple and similar integrated companies in the 70s to the DOS and Windows PC monoculture that began to flourish in the 80s and 90s. What the last three years' smartphone numbers actually show is a shrinking on the top and the bottom of licensed platforms, with growth coming from integrated platforms in the middle. The Symbian monoculture is rapidly shrinking, shown in the blue segments. 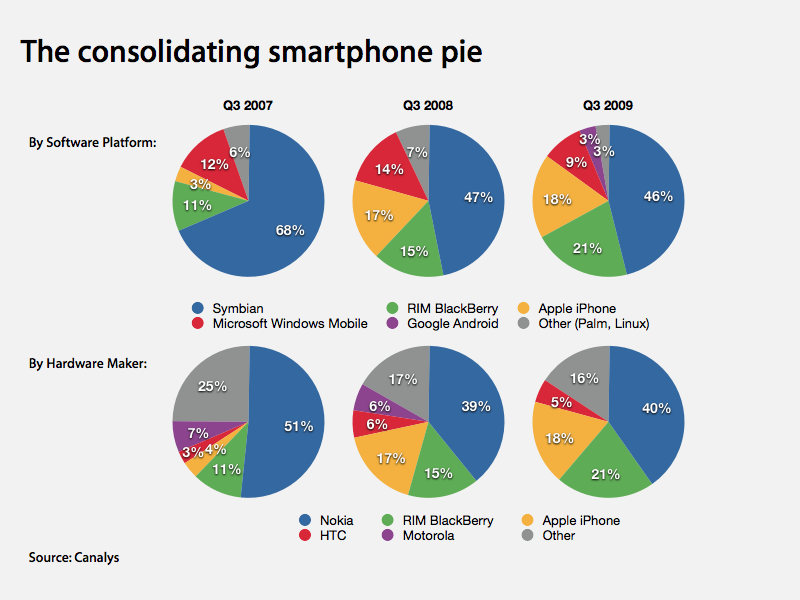 Apple and RIM, depicted in yellow and green in the pie charts, are both expanding dramatically. Meanwhile, the "other" manufacturers and licensed platforms outside of the top three are all shrinking away as well. Many attempts to introduce a new integrated platform into a mature market have fallen flat, both in PCs outside of the Macintosh (something discovered by Amiga, Atari, NeXT, BeOS, and others) and in MP3 players (like the Zune) and even smartphones (there does not seem to be much global market potential for the Palm Pre). Similarly, attempts to duplicate the business model of Windows PCs haven't worked out well in many places, even for Microsoft. Symbian, which has long been the "Windows of smartphones" outside of the US simply because there weren't many viable global competitors, is now abdicating the throne. But of all the alternative licensed platforms hoping to take its place, from the commercial Windows Mobile to free options including Google's Android and various other platforms built on top of Linux, none are making much progress. 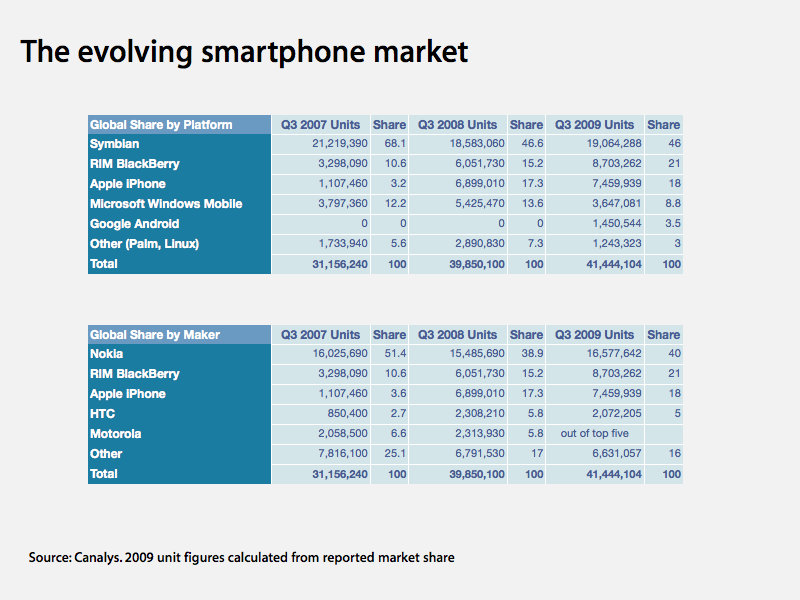 Outside of the top three platforms (Symbian, RIM, Apple), "everything else" has shrunk from 20% of the market a year ago to just 15% now. Rather than eating into RIM and Apple's integrated platform sales, Android appears largely to have cannibalized the use of other free Linux minority platforms and taken the lunch away from Microsoft's Windows Mobile. The largest backers of Android are HTC (which actually lost market share as its former sales growth plateaued over the last year) and Motorola, which is in such bad shape that it has fallen from Canalys's top five and joined the "other" pool without so much as even creating a ripple. Again, from a manufacturer perspective, outside of the top three makers (Nokia, RIM, Apple), "everything else" has fallen from 28% to 21% in just a year. This makes it essential for rival phone makers to distract from the smartphone market and talk about the vast numbers of low margin simple phones being sold. However, as that larger market continues to shrink, this will become increasingly difficult to do.